Vintage Original 1988 24 Hours of Le Mans Poster. June 11 & 12, 1988. The 1988 Le Mans poster is part of the "The star car used for sponsorship" era in Le Mans posters which lasted from 1981 to 1997. Design of the 1988 Le Mans poster was again in the hands of the S. Conseil agency and is based on a color photograph by Jean-Luc Taillade of the Nr 1 Jaguar XJR-9 LM of Martin Brundle and John Nielsen during practice (they would blow the head gasket, while in the lead, after 19 hours). 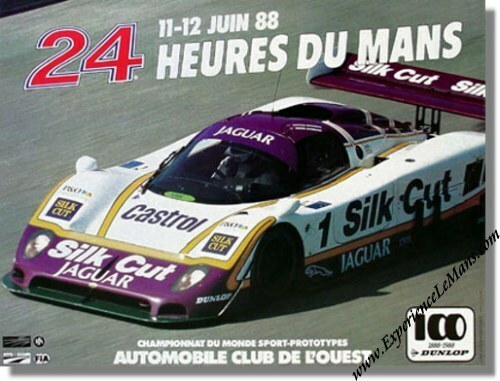 Sponsorship of the poster finally brought Jaguar luck as the race was won by Jan Lammers / Johnny Dumfries / Andy Wallace in their # 2 Jaguar XJR-9 LM with a total of 394 laps to their name. For the full results of this race, please see 24 Heures du Mans results 1988.